Are you tired of over-complicated video slot games? Are you a big fan of classic slot machines with basic graphics and only a few symbols? NetEnt has heard our complaints and has developed an easy-to-play game, one with a simple setup and easy-to-understand theme. We’d like to introduce Starburst Slot – a five-reel by 10-payline game that focuses on all the aspects that make slot machines fun to play. The game combines beautiful graphics and streamlined betting options so that both modern casino players and classic slot lovers will find something to enjoy. As one of the many titles from NetEnt that use only crystal symbols, Starburst is different from other games. For example, it has the BOTH WAYS feature. This feature allows you to form winning combinations from right to left and left to right. The animations and graphics on Starburst Slot are a marvel. Start playing the game using the free-to-play mode and you’ll probably think that you’re at a light show concert. The jewels, stars, and gems are brightly lit. In addition, the animations are a work of art. Most Starburst slot reviews describe the cosmic theme as outstanding, but we don’t think it’s that noticeable. The game offers the standard five-reel, three-row configuration and 10 paylines. To form winning combinations, you must land at least three similar symbols side by side, from left to right and vice versa. You’ll also come across multiple symbols, each with a different payout. The highest paying symbol is the golden BAR symbol, while the lowest paying symbols are the blue octagon and purple rhombus. The only thing that will discourage most people from playing this game is the fact that it doesn’t offer in-game features such as free spins, jackpots, or gamble bonus. However, if you are willing to overlook this fact, you will be pleased to learn that the game offers a top prize of £50,000. The Wild Symbol: This is represented by the multi-coloured star symbol. As a wild symbol, it can appear on reels 2, 3, and 4 to complete winning combinations by substitution. It’s also an expanding wild, meaning that it can expand and occupy the entire reel. In the process, it gives you more winning opportunities. 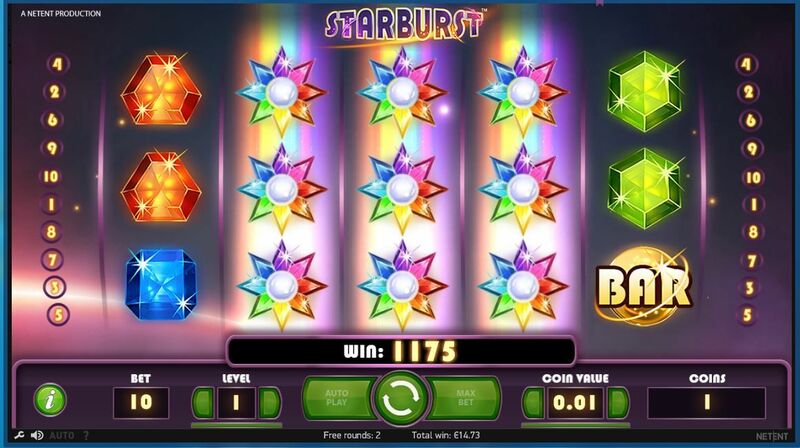 The Scatter Symbol: Unfortunately, Starburst Online Slot does not have a scatter symbol. Starburst Bonus Round: There’s no bonus game in NetEnt’s Starburst Slot. However, the good news is that there’s a win-both-ways feature that works together with the expanding wild to give you more rewards. With the right bankroll management strategy and correct stakes, you can easily walk away with the £50,000 top prize. Sometimes, less is more, and this is evident in Starburst Slot. We love the simplicity of this slot as well as its superb graphics, expanding wild, re-spin feature, and, most importantly, win-both-ways feature.